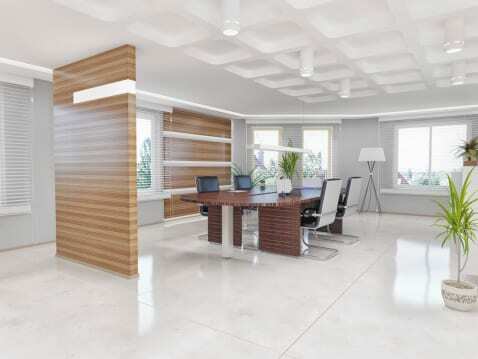 White, clean and shiny tile can be very welcoming to a potential client as they walk into your place of business. Now imagine that same white and shiny tile, with dark, grimy lines between each tile. Would this still be a welcoming environment to anyone that comes into your facility? The answer is obvious. While cleaning tile can be easy, cleaning grout can prove to be much more difficult. Thus, let us discuss some tools you will need for cleaning and maintaining your grout, as well as some tips to keep in mind. Before we begin, it is important to know that grout is porous. This means if not properly maintained, everyday dirt and grime can enter and become trapped in the tiny holes. The result is that your grout can begin to look dark, discolored or even stained. In some cases, grout can become so stained and discolored that the only way to fix it is to remove it and grout them again. This would be an unnecessary waste of time and resources. So before taking this step, try following the tips below to see if the stain can be successfully removed. Grout Scrub Brush. Many people will tell you in order to clean grout all you need is a good detergent and a toothbrush . This is true, a toothbrush can be a very effective tool in cleaning grout, but can you imagine cleaning a huge lobby with nothing but a toothbrush?It can add much strain to your back, neck, knees and wrist. A much more ergonomic way to clean grout is with a grout scrub brush. This tool gives the same scrubbing ability as a toothbrush, but because of its long handle, it allows you to scrub while standing up. Natural Citrus Multi-Purpose Foam Cleaner. This product works great in removing grease, dirt, oil or whatever else may be found in your grout. Another thing to consider is it's a foam cleaner which means it will stick to any surface that you spray. This is a lifesaver when it comes to cleaning vertical grout work that oftentimes maybe found in a bathroom. Simply spray, allow sometime to dwell and wipe off with a microfiber cloth. For those set-in stains, you may have to do some scrubbing with the Grout Scrub Brush. Lemon Tree Cleaner. This is an essential tool not only for cleaning grout, but also for proper maintenance. Simply dilute as directed on the bottle, apply liberally to the surface and wipe away with a mop or microfiber cloth. For those difficult set in stains, dilute this product in warm water and scrub in a circular motion with the grout scrub brush. In order to prevent dirt and stains from entering the grout, use this product in cleaning your tiled rooms regularly. It also leaves behind a pleasant lemon scent. Also available in pine tree and mint tree scents. Detergent. When trying to remove a difficult stain, it's always better to start with a mild detergent and work towards a stronger one. If you begin with a mild detergent and are not getting the desired results, you may find better results by allowing the detergent to dwell on the grout. After the detergent has been allowed to sit, you can use a scrub brush to wipe away the dirt. If the mild detergent fails to remove the stain, you may want to use a stronger detergent. Test first. Even with the mildest of detergents your tile or grout may react differently to certain chemicals. It is always better to test a hidden area first before applying on the remaining grout work. Under an appliance or in a small corner are perfect areas to try out a new chemical. Proper Maintenance. Like a sponge, grout is porous, making it very easy to stain. Keeping grout clean requires constant attention. For example, places such as lobbies and high traffic walkways are more susceptible to dirt and grime brought in from the outside. In order to prevent stains from setting in, these areas need to be cleaned on a more regular basis as opposed to other areas. Grout in dining rooms or kitchen areas are more prone to spills. Hence, when a spill occurs it is best to wipe up and clean the affected area before the stain can enter the grouts pores. Be Aware of Bleach Products. Bleach based products can actually remove the pigment out of colored grout. Always check to make sure the chemicals you are using do not contain beach. Also, never combine a beach product with an ammonia based cleaner as the combination can release a deadly vapor. Steam clean grout. Steam cleaning grout can actually bring the stain or dirt to the surface making it that much easier to clean. So, if you are still having problems removing a stain, you may have success using a steam cleaner. Yes, as business owners the impression our facility makes is important. Show your clients it's of chief concern by following these tips to keep your grout clean. This entry was posted in Floor Care, General Cleaning, Janitorial and tagged bleach, brush, citrus, foam cleaner, grout, lemon tree. Bookmark the permalink. Can you recomment a steam machine for grout cleaning. We don’t carry any steam cleaning machines, only the chemicals you can use in them. We do carry Grout Scrub Brushes (https://worldwidejanitor.com/scrub-brushes-c-110_107/grout-scrub-brush-p-490). However, if you think there’s even a slight chance that some in your facility may be plexiglass or some other type of plastic, make sure to use the “non-ammoniated” or ammonia-free glass cleaners, because over time the ones with ammonia will dull surfaces that aren’t true glass.